The Vehicle Entry Permit (VEP) system for foreign vehicles entering Malaysia via the causeway from Singapore has begun operating and ends on 15th July 2016. 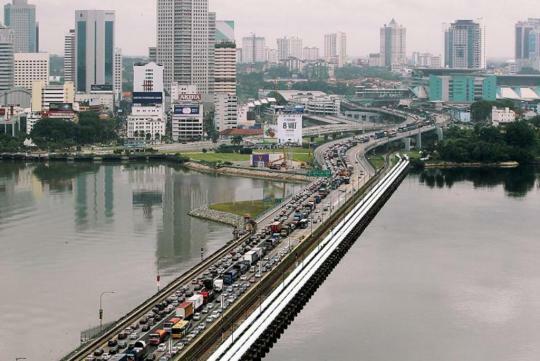 Starting from today, the system is undergoing its trial run and will be handled by the Road Transport Department (JPJ) to ensure the VEP system runs smoothly, according to Paultan.org. For drivers going in from the 16th of July, do take note that a VEP charge of 20RM will be imposed. Registration of vehicles for VEP will be until the end of the year and an estimated 120,000 Singapore vehicles have registered under the VEP system. You can register for the VEP here. The report also added that the system will be able to detect Singapore-registered vehicles that have yet to settle their old summons that have already been issued. However, it does not state whether the JPJ will insist on paying the fines on spot before entry is allowed into Malaysia. Expect congestion to be bad in the coming weeks for those venturing up north. This officially starts on 1 Oct 2016. The trial is now on. Motorists entering Malaysia via both links need to scan their Touch n Go card, but no payment will be deducted. The above was related to me by M'sia customs.